Hi everyone. Its been a crazy couple of months full of lots of celebrations, travel up and down the east coast, big moves, a new job and a bit of exploring. Matt will be working to catch the blog up on all the events but in the meantime, I thought I would chime in for a bit myself. You did read correctly, it says “new job” above. It’s true, I have started work as a physiotherapist in London. I have a locum (temporary) position through an agency. I started on June 2nd and am enjoying getting into a routine. I can even walk to work. In order to take advantage of my final few days without a work schedule, I took a day trip to Canterbury and to Leed’s Castle (some of you may remember Matt’s trip here last year) with a group called London Walks. London Walks organizes all sorts of walking tours in the city covering topics from Parliament and Big Ben to Jack the Ripper. Occasionally they do Explorer Days outside the city and I met up with the group for a chock full day of touring. We travelled by train to our first stop Canterbury. 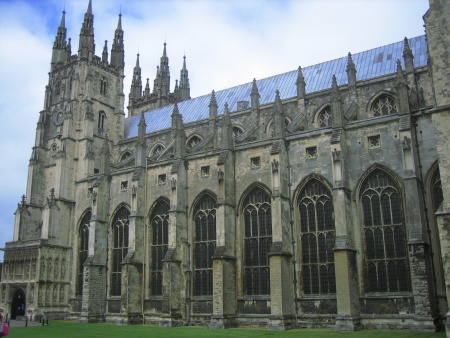 The main attraction here is the Cathedral which is home to the Archbishop of Canterbury and the destination for the pilgrims in Canterbury Tales. The Cathedral is where the Archbishop of Canterbury, Thomas Beckett, was killed in 1170 after King Henry II complained about his activities. The statue below is a memorial to the site of his assassination by four knights. After visiting the cathedral, we wandered through town and were educated on many historical events and buildings. We then set out for our next destination, Leeds Castle. Leeds Castle was built in 1119 by one of William the Conqueror’s Lords. It passed into royal hands and was used by many widowed queens after the death of their husbands. King Edward IV gave the castle to a courtier in the 1500s and eventually it passed into private ownership. The castle is now open for tours, conventions, weddings and other special events. It was jousting day at Leeds Castle so we had sometime to watch the intense competition before exploring the grounds. It was a nice way to spend my last day as a full-time tourist in the UK. This entry was posted on Sunday, June 8th, 2008 at 4:17 pm	and is filed under Carolyn, Life Abroad, London, Photos, Travel. You can follow any responses to this entry through the RSS 2.0 feed. Both comments and pings are currently closed. Can’t wait to visit in August – maybe these types of tours would be good for us, too. Does the horse in that picture have three feet off the ground? If yes….wow!!! Write again – and often – and let us know how the job is going and how it is/is not different from the way things are done here. Love to the three of you!! Thanks for the update, Carolyn! Good to hear from you here! Hear here! Entries (RSS) and Comments (RSS).20 queries. 0.286 seconds.